Eavestrough & gutter cleaning is an essential part of owning a home in Scarborough, but it’s also one that should be handled by professionals. Since these important drainage apparatuses are regularly filled with dirt and debris, they can often cause unwanted water damage throughout your home. They are very high up, however, which is why you need people with the right skills and equipment to perform proper gutter cleaning services. We are a fully liable eavestrough cleaning company with over ten years of eavestrough cleaning experience. We have the tools and the training to clean your entire system, including downspouts, fascias, eavestroughs, gutters, and everything else. 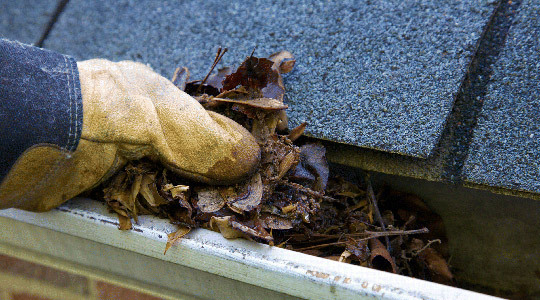 When your gutters are dirty, they can start to affect the entirety of your home. The water that leaks and overflows out of these dirty eavestroughs can get into your roof, your walls, and even your foundation, all of which require extremely expensive repairs. The best defence against these completely preventable costs is regular gutter cleanings performed by trained professionals. At NICK’S Window Cleaning, we can set you up with scheduled appointments that happen every year so you don’t have to even remember to book the appointment. Professional eavestrough cleaning in Toronto is what we do best, leave it to us and we’ll show you why more people are choosing us to keep their eavestroughing clean. Gutter sealing: Armed with our high quality sealant, our cleaners can ensure all of your gutters and eavestroughs are sealed up, stopping leaks and extending the lifespan of your entire system. Downspout guards: Without proper guards, water that rushes into your downspouts can splash out and cause serious problems. Our guards help direct the water into the right spots for more effective overall drainage. Eavestrough flushes: When your gutters are all cleaned out, we can perform a flush. This shows us exactly where any leaks are occurring in your gutters and eavestroughs. We can then fix or replace them as needed. When it comes to your gutters, only professional cleanings will give you the best results. You need people with the training and dedication it takes to clean out gutters and eavestroughs safely and effectively. That’s why we train all of our employees to clean gutters by hand instead of with imprecise and dangerous pressure washers. When done by hand, we can make sure your gutters are pristine and working before we’re finished. For tougher jobs, like post-construction work, we’ll often use a liquid cleaner that breaks apart almost any stain or stubborn mess. This procedure will get brand new houses ready to look their best for the market, or ensure your home’s drainage system is working properly after major renovations or construction. Our Scarborough eavestrough cleaning services are designed to protect your home from damage all year round. In the spring and summer, water that sits in your dirty gutters can seep into your roof and any nearby wood, leading to rot. The water that overflows can run down your house and cause flooding, foundational damage, and more. Spring gutter cleaning will stop these problems before they even begin. In the fall and winter, water left in the gutters will start to freeze and expand. This not only causes an additional strain on the gutters themselves, causing warping and breakages, it can also affect the gutter anchors. When this happens, your gutters could pop off your home entirely, potentially leading to additional problems. We provide eavestrough & gutter cleaning services in the Scarborough area, NICK’S Window Cleaning provides service to both commercial and residential buildings to a maximum working height of 3 storeys. Our professional team of experts will ensure that your business or home looks fantastic, not to mention has exceptionally clean gutters & eavestroughing allowing for effective and efficient drainage of rain water. Our multi-faceted team is fully insured, highly-skilled, and professional. The satisfaction of our customers is the a leading priority of our service, as we are looking to build relationships with our valued customers and thus delivering exceptional quality services is incredibly important to us and you. If you need your gutter or eavestroughing cleaned, give us a call and find out for yourself why more Scarborough residents are selecting NICK’S Window Cleaning. The only way to be sure that your eavestroughs are really clean is to hire a professional to clean them. When homeowners clean out eavestroughs they will almost always miss some of the debris or give up because the job is just too big and messy. But professionals have professional grade equipment like top of the line wet dry vacuums that can make cleaning out eavestroughs easier. A professional knows how to get rid of all the debris cluttering your eavestroughs. Another benefit from hiring a professional to clean the eavestroughs is that you don’t have to risk you life on a rickety old ladder. Falls from ladders can cause serious injuries. That’s because homeowners aren’t used to working on ladders and usually the ladders they have aren’t very good. A professional cleaner is experienced and comfortable working on ladders and had commercial equipment that will make it safer for them to be up high cleaning out eavestroughs. It is well worth the cost of hiring a professional so that you can stay safely on the ground. A professional can clean out eavestroughs much faster than you can on your own. Cleaning out eavestroughs by yourself can take days if there are no problems, accident or other incidents. It could take longer if you have trouble staying safe or if you find things like rodent nests or insect hives in your eavestroughs. Hiring a professional cleaner will get the job done right in half the time or less than it would take you to do it. So this year hire a professional to clean those eavestroughs and spend your time safely doing something that you like to do instead.